Info & Service - kettenbach-rostfreis Webseite! Determination of damages and expert reports are delivered within the shortest time possible. Design and construction proposals will be prepared. The use of stainless steel for the above purposes has increased considerably in the last several years. There are significant differences that must be taken into consideration when working with stainless steel in comparison to standard steel. Decisive for the choice of stainless steel is the resistance of the CrNi steel to corrosion. Austenitic CrNi steel is nonmagnetic. It is not difficult to weld because the thermally affected zone is very small and coarse grains are not formed. It is important for the correct welding consumables to be used when welding not only CrNi steel but also standard steel. The seam has to be properly finished after welding. Stainless steel is a chromium or CrNi alloyed steel that is nearly impervious to rusting and ordinary corrosion. Some types of stainless steel are austenitic CrNi steel and V2A and V4A steel. Under oxidizing conditions, a self-healing chromium oxide film forms on the surface of steel with a chromium content of more than 12-13 % that prevents rusting. Corrosion can occur if this layer is broken through. In addition to excellent properties for working with it, e.g., for welding and cold forming, stainless steel is frequently used owing to its resistance to corrosion, its smooth surface, and its architectural utility. Climatic and other environmental conditions are decisive for the selection of the optimal steel alloy. Usually the grade 1.4301 or 1.4541 is sufficient, however. Only companies that are certified according to DIN 18800-7 class D and whose welders are certified according to DIN EN 287-1/DIN EN 1418 may carry out such construction work. Moreover, a welding engineer must be employed by the company and a qualified representative must supervise the work on site. If it is to welded, the physical properties of CrNi steel must be taken into consideration as early as the planning stage. The thermal expansion coefficient of CrNi steel is about 40 % higher than that of standard steel. This means that it expands further when heated and shrinks more when it is cooled, which can cause warping. Moreover, its low thermal conductivity causes deformation. Joined metal pieces must be welded all the way around. If gaps are necessary, they must be of sufficient size to avoid corrosion. 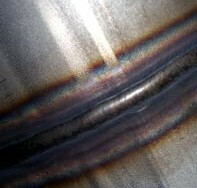 Only certified welders may be employed for welding stainless steel. 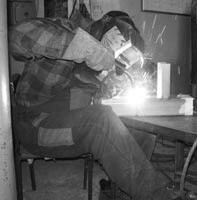 If at all possible, welding at the construction site should be avoided because follow-up work on the weld seam is often not possible or can only be done inadequately. The tools and equipment used for the assembly of CrNi steel should be employed exclusively for this purpose. 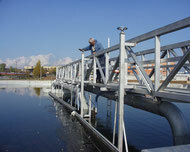 All machines and components produced by Kettenbach-rostfrei for water treatment plants and other structures are installed reliably and on time by trained personnel and certified welders. Products of other companies are installed according to the guidelines of the producer. The two parts of a scraper bridge was welded on site and the accessories installed; it was then lifted onto the clarifier basin. A gate was installed in a runoff overflow basin. A channel/trough for removing clarified water is welded on site. Deconstruction of plastic pipelines and construction of stainless steel pipelines (Mat. 1.4571) in a pump basement of the landfill site Lahe (Waste Management Hannover County).